John-Joe O’Toole believes the current Cobblers squad has what it takes ‘to bounce straight back’ and claim promotion from Sky Bet League Two next season. A veteran of the class of 2016 that took league two by storm and landed the title under Chris Wilder, the midfielder will be one of only a handful of survivors from that team when Town kick-off the new campaign in August. 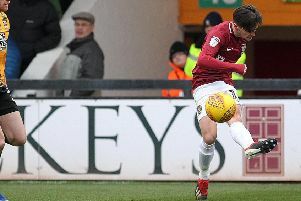 Cobblers’ relegation from league one was mathematically confirmed with last Saturday’s 2-2 draw with Oldham Athletic, and although O’Toole admits that is a huge disappointment, he is already looking to the future with positivity. The former Bristol Rovers man was a key figure in Town’s storming success two years ago, knows exactly what it takes to win a title, and he believes the club again will have the tools to do the job. Asked what it will need for Town to plan another promotion push, O’Toole said: “It is going to take a lot of effort, like last time, and everyone pulling together and all the fans being behind us, like they have been. “You need a lot of togetherness, fight and the right decisions being made on and off the pitch, and I think we will be fine. “We had a really good group that season, and it was quite unfortunate that we didn’t keep that group together for a little bit longer, but that is how it goes in football. “We have a good group here now too, and I don’t see why we can’t bounce straight back. The Cobblers ended the league one campaign in a disappointing 22nd place in the table, above only Bury and Milton Keynes Dons. A late-season flurry under caretaker manager Dean Austin, following the sacking of Jimmy Floyd Hasselbaink, proved not to be enough, with the Cobblers players leaving themselves too much to do. O’Toole has spoken glowingly of Austin’s effect on the team since he took control, saying he has ‘been a breath of fresh air’, but he accepts that the team’s performances haven’t been up to standard. “I think we all know it is disappointing (to be relegated), and we haven’t done enough,” said O’Toole, who scored six times in 26 starts and four substitute appearances in an injury-hit campaign. The players will now all go off on their summer holidays before returning for pre-season at the end of June. And O’Toole insists that getting a proper rest is crucial for every footballer, no matter how good or bad their season has been. Asked about how crucial it is to have a break from the game, O’Toole said: “It is massive for the players, regardless of whether you get promoted, relegated or whatever - it is a long season. “Your body needs rest, we are not robots, we need rest and you need to make sure you come back in the right sort of shape, but I think rest is really important. A fans’ favourite and club talisman, O’Toole also made a point of thanking the club’s supporters for their backing despite a poor season on the pitch. “The supporters have been brilliant,” said O’Toole, the runner-up in the Chron’s player of the year vote, which was won by Ash Taylor. “Fans make football clubs, and the fans here are brilliant. “All the players and staff really appreciate them getting behind us, and we are gutted for them that we couldn’t quite get over the line.